We've talked for a long time about putting a page up on our web site that showcases the bikes that we, the staff of Century Cycles, ride. Being that we're always tinkering with the setup and components, it seems like our stable of bikes in constantly changing, so I figured it would be easier just to make this a recurring feature here on our blog. First up is Brent, from our Peninsula store. When heading out on an off-road excursion, Brent takes his "Mint Chocolate Monkey." 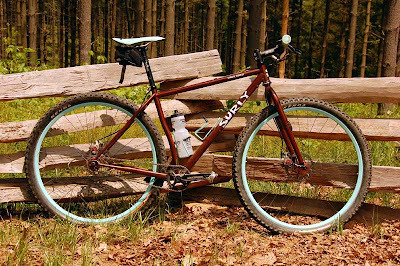 Based on the Surly Karate Monkey frame (in Chocolate Brown), it's a 29-inch wheeled singlespeed mountain bike. To add the mint, he added whatever components he could find available in Bianchi's trademarked Celeste color, including Velocity VXC Disc rims, Velocity bottle cages, Selle San Marco Ponza saddle, and Oury grips. The components are rounded out with a Race Face crankset, Salsa handlebar, stem, and seatpost, FSA headset, Avid BB7 mechanical disc brakes, White Industries ENO Singlespeed freewheel, and limited edition brown Surly singlespeed hubs. 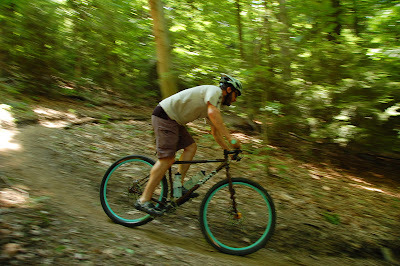 Brent is also the proud owner of a Surly Cross-Check and a Surly Pacer. Thanks to Doug for the photos!